You are here: Home / What Type of Replacement Gas Boiler do I need? How to know what gas boiler to buy? The moment your boiler “goes on the blink”, you just know that it’s going to be something expensive, because that’s how life goes – however, if you get lucky, it may just be a thermostat or a problem with a pilot light. For those of us less fortunate, very often, the fact that we have putt off servicing our boilers properly is about to give us a headache or 2. But what type of boiler should you be looking for if you need it replaced (for more information go here)? Numbers 1 & 2 are typically what are referred to as system boilers. 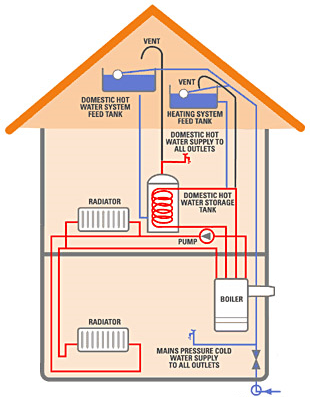 These water heating devices are more often used for larger homes or one’s where there is a lot of demand for hot water at the same time (large families). Number 3 type products are what are known as “combi-boilers”. These are smaller devices that produce hot water on demand, but can only support a limited “flow”. That means if a lot of folks use the water at the same time, it can run cold, or slow down a lot – they are very good and super-efficient, so as long as you don’t have 3 people showering at the same time as you run the central heating and “do the dishes”, they are very capable devices.